Just as the Duchess of Marlborough's emeralds were, a few years ago when she first began to display them, the objects of many admiring remarks in London, so Mrs. Edward T. Stotesbury's diamonds are now the talk of the town. The Philadelphia banker's wife  loves jewels for their own sake, and can discuss the good and bad points of a gem with an expert's knowledge. All her stones are of the finest water, and a number of them, gathered at the cost of much time and trouble, are of incomparable beauty. London first saw them at the recent Court, when Mrs. Stotesbury was presented to the King and Queen  at Buckingham Palace, and since then their fame has grown, so that "Mrs. Stotesbury's diamonds" has become as current a phrase in conversations of which feminine adornments form the topic as the Countess of Torby's pearls , the Duchess of Marlborough's emeralds , or the Duchess of Westminster's famous tiara . This last mentioned ornament is in danger of losing its proud and hitherto undisputed prominence in the way of tiaras, or "fenders," as they are sometimes irreverently called. Mrs. Stotesbury's tiara is running it a close race. Mrs. Stotesbury's is not so high as the Duchess's, but has affixed to it six pendant pear-shaped diamonds, which are calculated to make smaller jewels pale their comparatively ineffectual fires. A high diamond collar with many beautiful stones in the collar itself and a number of pear-shaped pendant gems is another of Mrs. Stotesbury's much admired possessions; while she has a pair of drop earrings, consisting of two large stones, each nearly as big as the smaller of the two chief pieces into which the Cullinan diamond was cut . The largest portion of the Cullinan diamond is set in the King's crown, while the portion next in size is worn by Queen Mary on special occasions. History does not state what the Queen thought when she saw the American woman making her curtsey with several gems rivaling Her Majesty's most brilliant ornament, at least in sparkle, if not in size. It would be impossible to enumerate all of Mrs. Stotesbury's jewels, but a sapphire pendant is understood to be unique both in respect to color and size. The size is that of a silver dollar. 1. In January 1912, the widowed investment banker Edward T. Stotesbury married Eva Roberts Cromwell, who had also been widowed. The pair lived large; along with Eva's famous jewels, the pair collaborated on numerous elaborate estates in America. Eva had three children with her first husband. Her daughter, Louise, was the first wife of General Douglas MacArthur. One of Eva's sons, James, married two heiresses: Delphine Dodge (of the automobile company) and, famously, Doris Duke. 2. King George V and Queen Mary of the United Kingdom. 3. 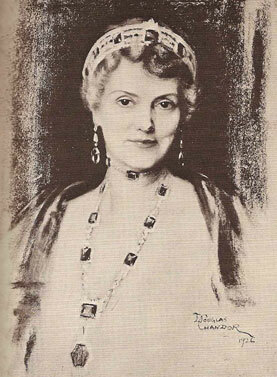 Sophie of Merenberg (1868-1927) was the morganatic wife of Grand Duke Mikhail Mikhailovich of Russia; her uncle, Grand Duke Adolph of Luxembourg, gave her the title of Countess de Torby. One of Sophie's grandfathers was the Russian poet Alexander Pushkin. Her daughters were Lady Zia Wernher and Nada Mountbatten, Marchioness of Milford Haven. 4. In 1912, the Duchess of Marlborough was Consuelo Vanderbilt. 5. 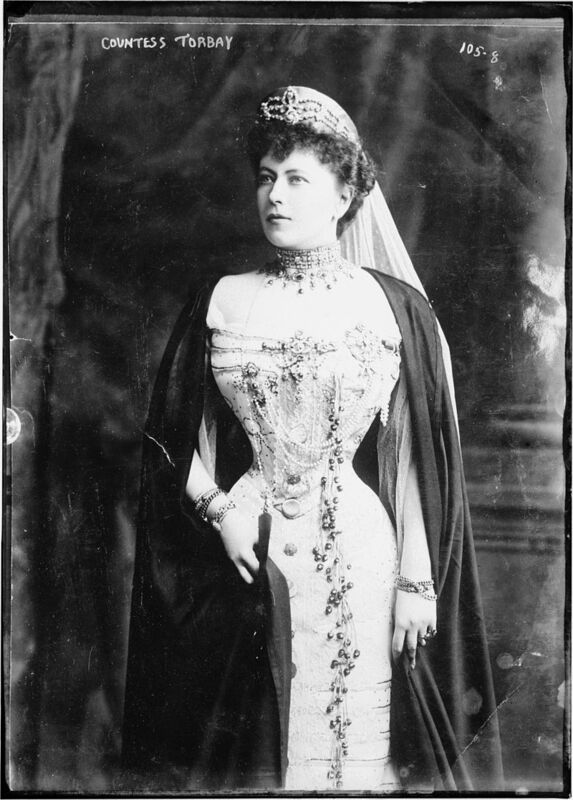 The Duchess of Westminster in 1912 was Constance Cornwallis-West. 6. For more on the Cullinan diamond, read my extensive post on the gemstone.